Coleco games have a gray or white casing with grooves on the side near the end label, and a beveled underside with the Coleco logo embossed in the plastic. Labels have a black background with the game logo in color, and some informational text in white and yellow below that. 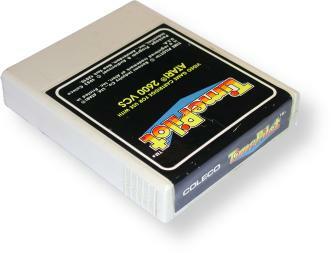 The end label is black and with Coleco in white text along with the game's logo.